Iraqi Kurds allege chlorine gas attack by ISIL. Kurdish officials say remnants of a suicide blast on highway between Mosul and Syria showed presence of chlorine. Kurdish authorities in Iraq say they have evidence that fighters of the Islamic State of Iraq and the Levant (ISIL) used chlorine gas as a chemical weapon against their peshmerga forces. The Kurdistan Region Security Council (KRSC) said in a statement on Saturday that EU-certified laboratory tests showed that soil and clothing samples collected from the remnants of a suicide blast in northern Iraq in January had levels of chlorine that indicated the substance was used as a weapon. 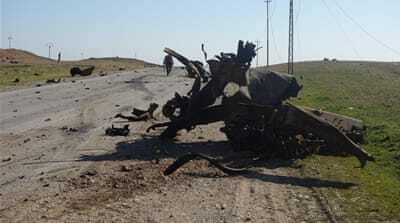 The Reuters news agency, however, cited a Kurdish security source as saying that the Kurdish forces fired a rocket at the vehicle carrying the explosives, so the only casualty was the lorry's driver. However, about a dozen peshmerga fighters experienced symptoms of nausea, vomiting, dizziness or weakness, the source said, which could be attributed to exposure to chlorine. The KRSC also reported witnessing signs of chlorine used in recent fighting around the Iraqi city of Tikri. "Similar attacks have been recorded on video showing plumes of orange smoke, an indicator of the presence of chlorine", it said. The Kurdish allegation could not be independently confirmed. The statement said that a lorry loaded with around 20 gas canisters exploded on a highway between the Iraqi city of Mosul and Syria, as Kurdish fighters were being deployed following an offensive against ISIL fighters.